The Lemo is an RTA (rebuildable tank atomizer) from iSmoka Eleaf. It comes in stainless steel or black finishes. 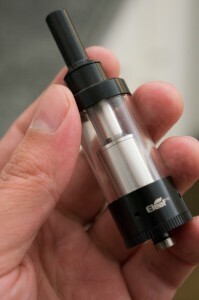 Its also available in a Lemo Drop edition that simply features a smaller tank if you want a shorter device. 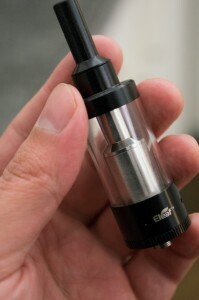 A few years ago we saw the Kayfun Lite emerge as the absolute definitive tank in the vaping world. At the time the Kayfun was great. 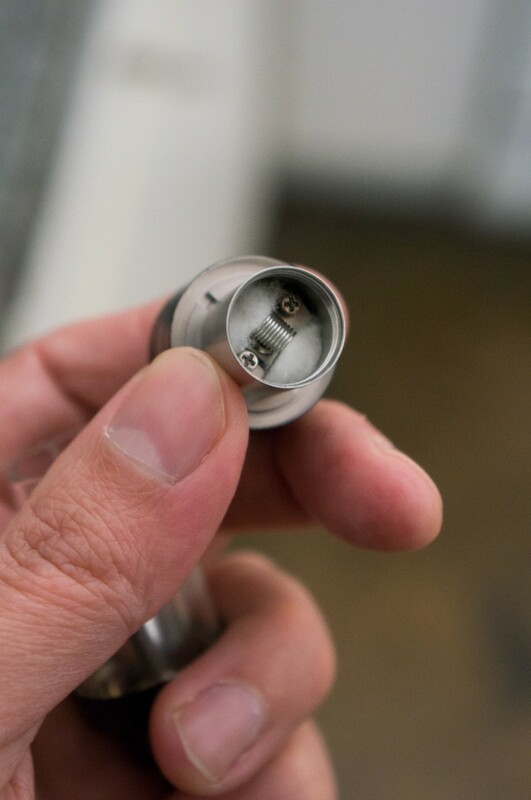 The flavor was better than anything else we had due to the innovative design featuring a small coil chamber and the air vents directly beneath the coils. And it was a tank which meant you didn’t have to drip. But the Kayfun had its issues. The price was well over $100 when it came out. It was a complicated design with lots of parts and the airflow was weak to say the least. In fact the airflow was so tight – it was a mouth hit only device. Several designs came out by other manufacturers and we’ve started to see the design perfected, the airflow improved and the price drop. The Lemo represents the latest in this evolution of vape tank design and its an outstanding tank for an outstanding price. In fact, if you like to use tanks and you like a nice big airflow – purchasing a Lemo is a no-brainer. Its simply fabulous. I’m going to start by talking about the airflow since this is the real standout feature on the Lemo. The airflow is WAY better than what we had with the original Kayfun. There are 4 airflow channels that lead to the coil and the airflow is big enough for lung hits. Finally!!! If you’re a lung hitter and you’ve always wanted a tank that would let you do this – this is your tank. I love that the airflow is big. it is adjustable via the screw inside the base. Not the best location, but once you have it set you can forget about it. I actually like having it inside because I won’t accidentally move it around. I’ve been vaping my Lemo at 25 watts with a 1.1 ohm build and its been perfect. And did I mention lung hits?!? You get way more airflow on any tank – even more than the Fogger. Compared to the Aspire Atlantis – they both deliver massive air flow, but I like the Lemo a little bit more. It holds more juice and the airflow is smoother. The flavor might be a little better as well. The Atlantis is still an amazing tank and I’m still using it, but I think the Lemo has a slight edge. The Lemo is much easier to rebuild as well which to me makes more sense than the odd replacement carto that the Atlantis uses. But if you don’t want to build, the Atlantis might be better for you. The Lemo is a very similar design to the Kayfun Lite, but with many, much needed improvements. Three are essentially 5 sections that make up the device. 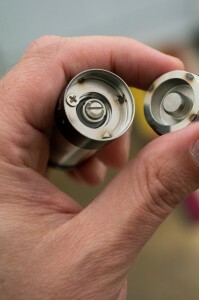 There is the airflow/fill chamber, the deck, the coil chamber, the tank and the drip tip. 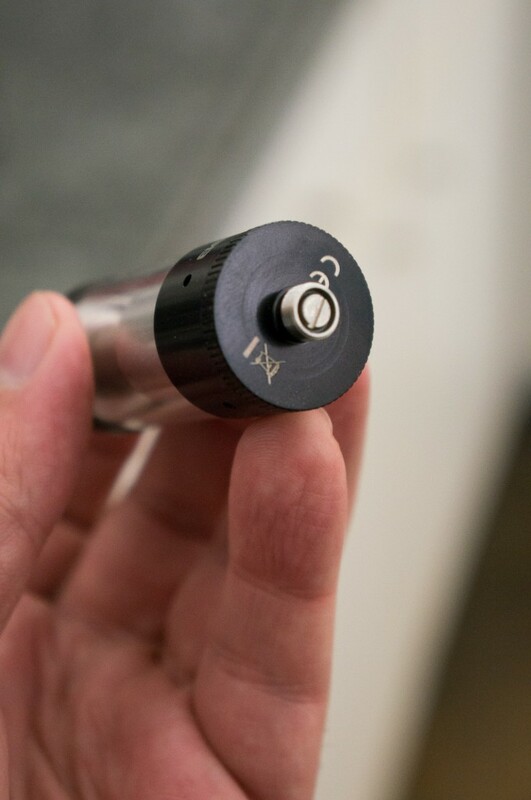 The drip tip is a standard 510 connection so you can put any drip tip you like on the Lemo, though I like the included drip tip just fine. The base features an adjustable 510 pin and removing this base reveals the airflow holes and the fill screw where you insert the e juice. The deck is a similar design to the original Kayfun, but MUCH improved. There are 2 contact screws and optional insertion slots. 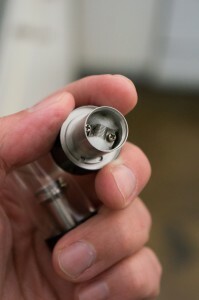 You can build using the insertion slots for your coil leads or you can just use the screws. I’ve found this to be extremely easy to build on. The Lemo comes with a 1.1 ohm build already built and wicked with cotton so this is, in fact, ready to fill and vape right out of the box with no building required. Nice touch! The tank holds an impressive 5ml of liquid. If you need a tank that you can fill and it will last all day, this is your tank. The overall build quality is excellent. The Lemo is actually lighter in weight than you’d expect. Its very comfortable to use on a mod for a tank of this capacity. A lot of these big tanks tend to be “top heavy” – the Lemo is perfectly comfortable in my opinion. Lemo now comes in a second edition called the Lemo Drop. The Lemo Drop is the same specifications as the Lemo, but built with a 2.7ml tank instead of the big 5ml. In other words, its almost half the size if you want an RTA that keeps a shorter profile. Honestly, 2.7ml is still a big capacity and works just fine. Which one to choose depends on how much capacity you want in a tank and how often you want to fill it. Actually, at the $35 price point – get both! Its still cheaper than the Kayfun Lite! All in all this is an extremely impressive tank. The airflow is amazing and if you’ve wanted the Kayfun flavor with a tank that lets you do lung hits – this is your RTA. I would actually say this belongs in every collection.